I’ve said it before and I’ll say it again, macaroni and burgers go together like peanut butter and jelly. 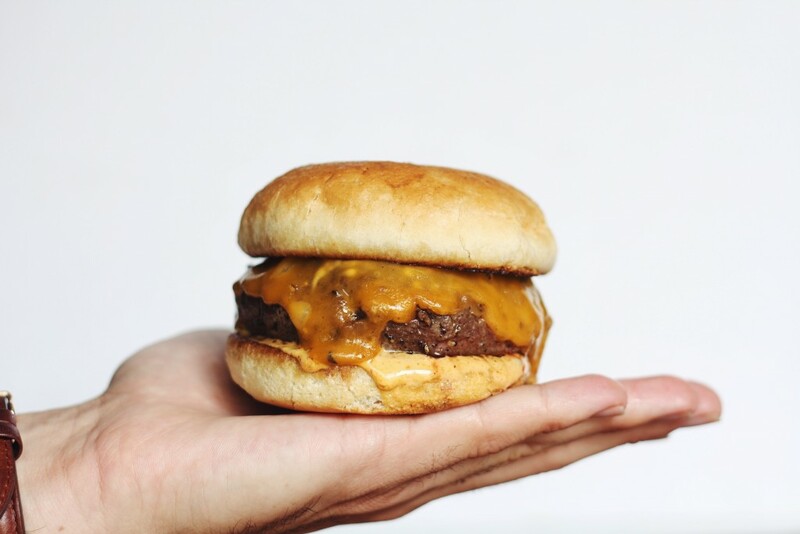 It’s basically the ultimate cheeseburger. This macaroni is made with aged cheddar and gruyere, and then the slider is topped with even more cheddar, because you can never have too much cheese. The sliders definitely don’t need the bacon but it does add a nice crunch and a bit of texture. I also used Sriracha mayo for a bit of heat. 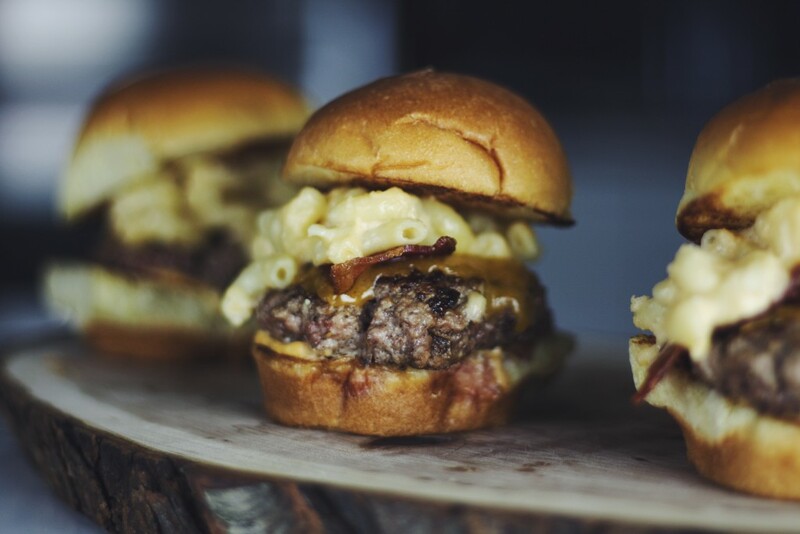 The soft and gooey macaroni, the juicy burger, and the crispy bacon all work together to form the perfect bite. I kept it pretty simple but you could also add some other toppings. Jalapeños would work well if you wanted some extra heat. A big part of what makes these sliders so good is the buns. I went with mini brioche buns. They are so buttery and really take things to the next level. If you can’t find these don’t worry, regular slider buns will still be alright. The macaroni recipe will make more than you need for the sliders, so feel free to half it if you don’t want a lot of leftovers. I usually like to make a big batch and freeze the extra in individual portions. It actually freezes quite well and is perfect for a quick snack. 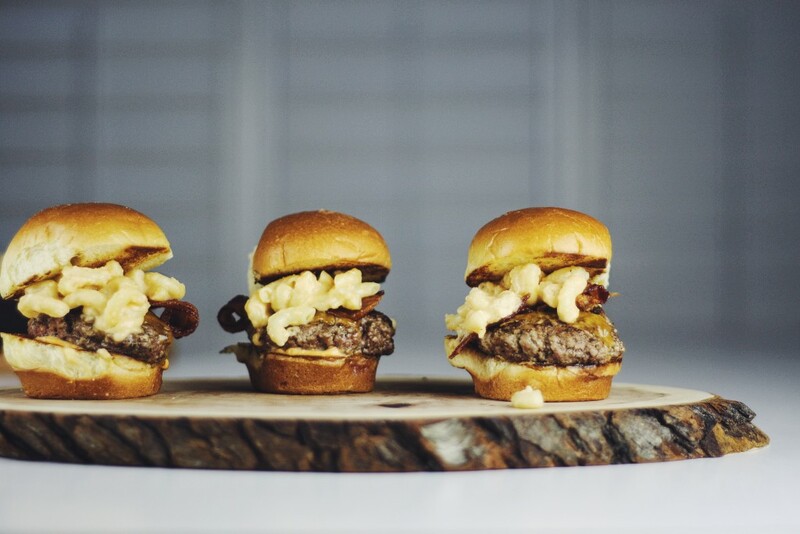 If you’ve never tried macaroni on a burger, just trust me and give these sliders a try. Start by mixing the mayo with the Sriracha in a small bowl. Place in fridge until ready to build sliders. Preheat oven to 375°F. Place bacon on a parchment paper lined baking sheet and cook in oven for 20-25 minutes or until golden brown. To make the macaroni, start by cooking the noodles according to package directions – they typically take 5-7 minutes in boiling water. Set aside when ready. In a large pot over medium heat, melt butter and then add the flour. Constantly whisk until golden brown. Slowly pour in the milk while constantly whisking. Continue to stir until it comes to a boil. Reduce to a simmer and then stir occasionally until the sauce has thickened. Add the salt, pepper, and mustard powder. Add in the cheese in 3-4 batches stirring between each batch until the cheese is fully melted. Turn off the heat and add the cooked noodles to the pot, then stir to combine everything. At this point it may be a little wet but the sauce will continue to get thicker as it sits. Form the beef into 8 equal 2 oz sliders and season both sides well with salt and pepper. Heat a skillet over medium heat and melt the butter to fry the sliders. Cook for 1½ – 2 minutes per side for medium rare. Cut each slice of cheese into 4 equal squares and place them on the sliders after you flip them. In a separate skillet, melt the other half of the butter and toast the buns for about a minute or until golden brown. To build the sliders, spread a layer of Sriracha mayo on the bottom bun and then place on the patty. Top with half a slice of bacon and then spoon on the macaroni. Add the top bun and you’re good to go. It seems like there is some sort of national food day going on every single day. April was national grilled cheese month and now May is national burger month, which I’m definitely not complaining about. I’m all about any excuse to make and eat burgers. To kick off national burger month, I combined two of my favorite foods, fried chicken and burgers to create the ultimate fried chicken burger. 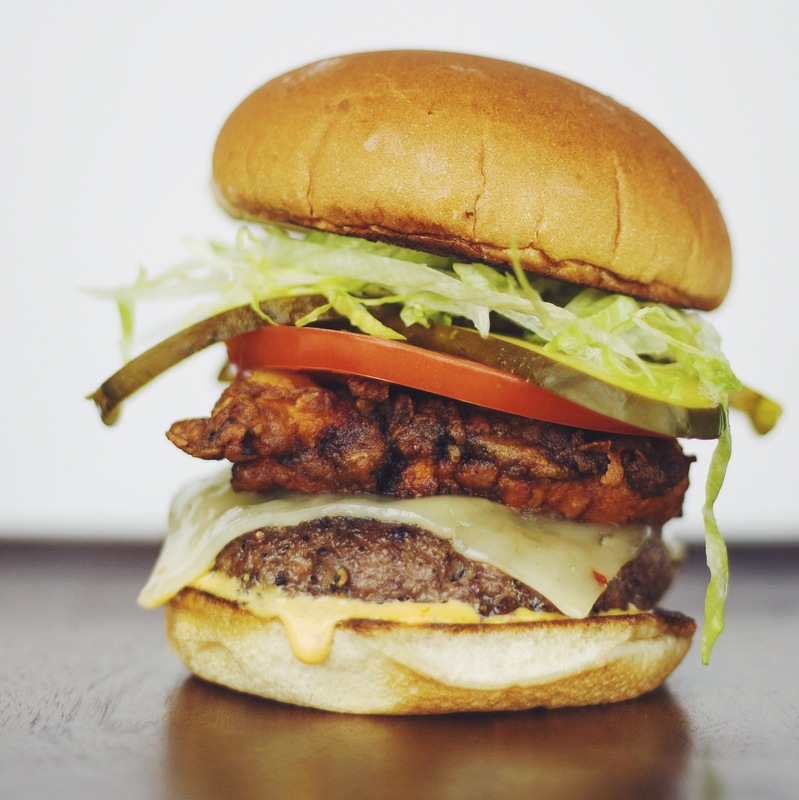 It starts with a juicy 1/4 patty made from ground chuck, then a crispy piece of fried chicken that’s been marinated in buttermilk and hot sauce. It’s topped with some shredded lettuce, pickle and tomato for a bit of a refreshing crispness. In a bowl, marinate the chicken in the buttermilk and hot sauce and refrigerate for at least 2 hours and up to 24 hours. Set up another bowl and combine the flour, salt, cayenne, garlic powder, and paprika and combine well. Working one piece at a time, move the chicken from the buttermilk into the flour and coat well, then back into the buttermilk and then into the flour again for a second coat. Place on parchment paper and heat oil to 365°F. Carefully place the chicken into the hot oil and fry for about 5-7 minutes or until an internal temperature of 165°F is reached. Heat skillet over medium high heat and melt in 2 tbsp of butter. Form the meat into 4 equal sized balls and gently squish them into patties using your hands. You want them to be slightly larger than the buns (check out my burger tips for more info). Season one side generously with salt and pepper. Fry for about 2 minutes per side and be sure to season the unseasoned side once they are in the pan. Place the cheese on the burgers right after the flip so it starts to melt. While the burgers are cooking, melt remaining butter in a separate pan over medium high heat and toast the buns until golden brown. To build the burgers, spread a layer of your favorite sauce (I used this special sauce) on the bottom bun and then top with the patty, then the chicken, and then the tomato, pickles, and lettuce. Squish on the top bun and then dig in! As you can probably tell, I like to enjoy a good burger from time to time. Over the years, I have gotten pretty good at making them, or at least I think I have. 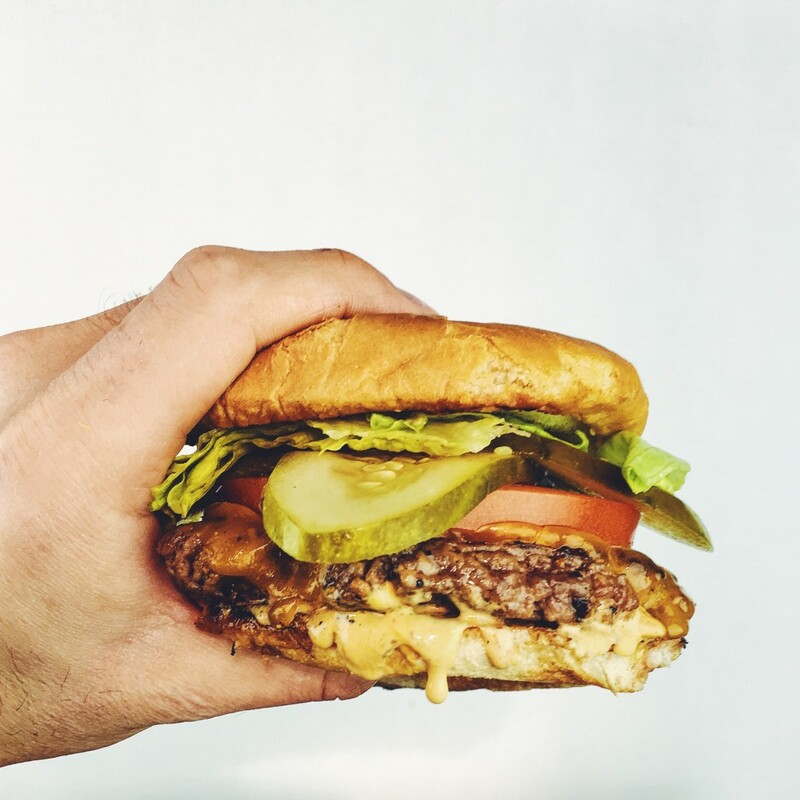 Everybody always asks me how I make them, and what recipe I use so I thought it would be a good idea to give you my tips on how to make an amazing burger every time. 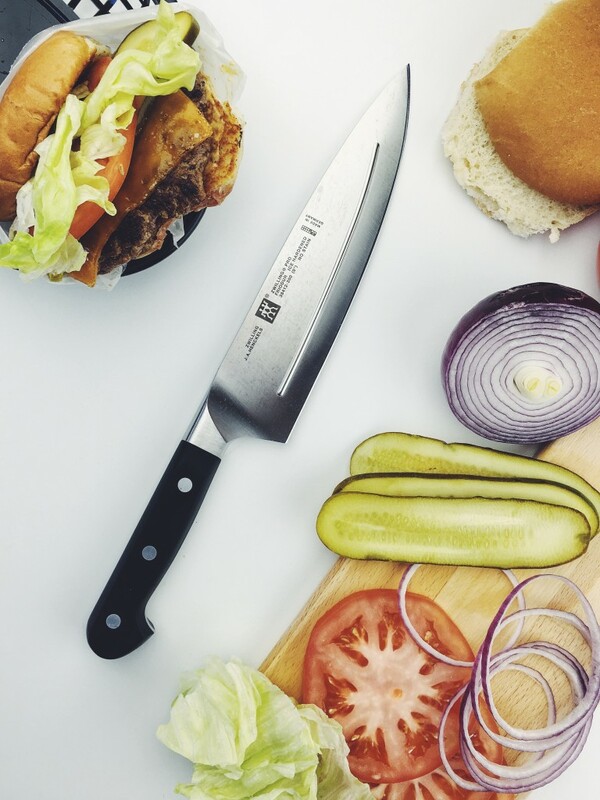 Follow these tips to learn how to make the best homemade burgers. As with many things, simplicity is key. This is especially true when it comes to burgers. A lot of people mess burgers up by adding things to the meat. I’ve seen people add breadcrumbs, eggs, garlic, onion, you name it. But the truth is, all you need is the meat. Anything else is going to mess it up. It’s true that an egg will help bind a burger and hold the meat together, but you don’t want your burger to be tight and packed. A good burger should easily crumble when you bite into it. Easy enough right? When possible, always use freshly ground meat for your burgers. You don’t need to own a meat grinder, just ask your butcher to grind it for you. When it comes to meat, there are several options you can choose from. I think the big 3 are chuck, short rib, and brisket. My personal preference is to use 100% chuck but its totally acceptable to switch it up and combine them. Adding short rib to the mix is great if you want to add a richness and savoury flavour to the burger. It would work great for a korean-bbq themed one. I often see that when people make homemade burgers, they use ring molds and really pack the meat in. This is a big mistake and will result in a tough burger. What you want to do instead is gently form the burgers with your hands. First, divide the meat up and form it into balls. Then gently press down with your hands to form the patties. It’s ok if they are not perfectly round. You do need to handle them with care when cooking, since there is nothing holding the meat together, they can fall apart if you aren’t careful. There is no guide to choosing the right toppings; it comes down to personal preference. But one thing I will say is that you don’t want to put on too many toppings. I usually like to stick to the classic cheeseburger with lettuce, tomato, and pickle. Onion is also a good option and jalapeño is nice if you’re craving something spicy. Whatever you choose, just remember that the meat is the star of the show and you don’t want to get too off track. You’ve put all the work in to create the perfect burger, now all that’s left to do is cook it properly. Whether your cooking on the grill or cast iron, a dry overcooked burger is never fun. After all, one of the most important parts of the burgers is its juiciness, an overcooked burger will definitely kill that. I usually like to make my burgers pretty thin and as a result, I only cook them for 1 and half minutes per side. This gives me a perfect pink interior. If you prefer a thicker burger, adjust the cooking time as necessary. If you don’t have a Nomiku, you seriously need to consider getting one. Not only does it make some of the best steak I’ve ever had, but it also makes one of the best burgers I’ve ever had. This will be the juiciest burger of your life. I’m telling you, once you go Nomiku, there’s no going back. Get you’re own Nomiku at nomiku.com and use the code ‘thechefdan’ for $20 off the wifi version. You’ll thank me later. This recipe is just for the actual burger. It can be dressed however you want! Fill a large pot or cooking safe container with water and attach the Nomiku. Set the Nomiku to 135°F. (This temperature will give you a perfect medium-rare. If a more done burger is desired, increase the temperature as necessary. Form ground chuck into a ball and then gently flatten into a thick patty using your hands. Chill the patties in the freezer to help them keep their shape when they are bagged. Place the patty into a large Ziplock and seal using the Water displacement method. When the Nomiku water bath is at desired temperature, place the sealed Ziplock in ensuring the burger is fully submerged. Allow to cook for 1 hour then remove from water. Remove the burger from the bag and dry well using paper towels. Allow it to rest for 10 minutes to slightly cool down. Pre heat cast iron skillet to high until it is screaming hot and smoking. generously season both sides of the burger with salt and pepper. Drop half the butter in the pan and carefully place in the burger. Sear for no more than 1 minute per side. Assemble burger as desired and enjoy one the best burgers you’ve ever had. The next time you’re craving take out, save yourself the trip and make these instead. It’s surprisingly easy to replicate that classic fast food feel at home. The key is thin patties, and a super hot pan to get a nice sear. These are guaranteed to satisfy and you know exactly what’s in the food you’re eating. Divide chuck into 4 equal balls and flatten into 1/4” thick patties, liberally season them with salt and pepper. Heat cast iron skillet to high and melt in butter. Add the burgers to the pan and cook for up to 2 minutes then flip. After the flip, add a slice of cheese to each patty and cook for another 2 minutes. Place buns in the skillet, cut side down until lightly toasted. Assemble the burgers with lettuce, tomato, and condiments of your choice. To make the fries, peel the potatoes and cut them into fry size pieces. Soak the cut potatoes in ice water for an hour to remove excess starch. Heat oil to 325°F and cook fries for about 10 minutes until lightly golden. Remove fries from oil and increase the heat to 375°F. Place the fries back in the oil to finish cooking for about another minute or until golden brown. *For an authentic fast food experience, wrap the burgers in wax paper before serving. Make a big batch of these burgers to keep in the freezer for a quick and easy weeknight meal. They are delicious on lettuce “buns” but also work great between normal hamburger buns. These burgers are also completely vegetarian and gluten-free. I had the pictured burger on an english muffin with avocado, tomato, red onion, cheddar cheese, arugula, and Sriracha mayo. Add quinoa to 2 cups of water (can use chicken stock if you want) and bring to a boil. Reduce to a simmer for 20 minutes and then fluff with a fork. Pre-heat oven to 350°F Peel sweet potato and cut into large chunks. Drizzle with olive oil and bake for about 1 hour or until soft. The previous steps can be done in advance. In a food processor, combine black beans (reserve ¾ cup for later), oats, onion, garlic, roasted red pepper, chipotles pepper, chili powder, cumin, salt, and pepper. Pulse several times until well incorporated. Place mixture in a large bowl along with cooked quinoa, reserved black beans, and finely chopped sweet potato. Mix everything together, cover and refrigerate for ½ hour. Preheat oven to 400°F. Line a baking sheet with parchment paper and lightly grease with olive oil. Form patties with about ½ cup of the mixture and place on baking sheet 1 inch apart. Bake for 30 minutes. Serve with your favorite toppings and condiments. I first heard of cheeseburger spring rolls at a restaurant called Lee in Toronto. It’s one of their signature items so I figured they had to be good. And I was right. They were good. Really good. So good that I had to try making them myself. It may seem like a weird combination but I’m telling you, it just works. They are also really versatile. You can serve them on their own, with dipping sauce, or put them on lettuce “buns” and dress them up like you would an actual burger. The possibilities are endless. Give these cheeseburger spring rolls a try; you won’t be disappointed. Recipe below! To form spring rolls add about a tablespoon of the mixture onto the wrappers with the corner facing away from you so it looks like a diamond. You want to place the mixture near the top of the wrapper. Fold the top towards you, wrapping the beef tightly and fold the outer to edges towards the center. Tightly roll towards you and seal with the flour/water mixture. Repeat until you’ve used up all the beef. Sometimes you need a big juicy cheeseburger. Other times you need a warm bowl of macaroni & cheese. But what about those times where what you really NEED is both. Finally, a solution to one of life’s biggest dilemmas has been solved. I present to you, the mac & cheeseburger. 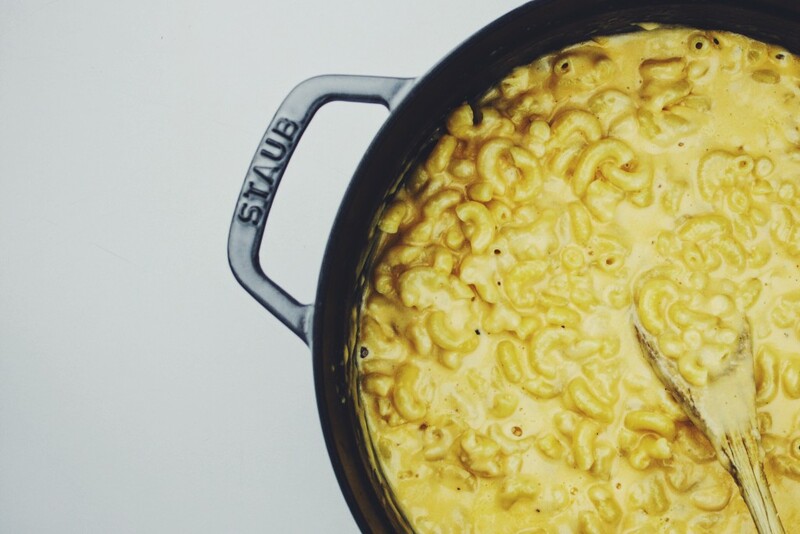 It brings together two worlds of cheesy goodness into one delicious package. Not to mention the addition of deep fried goodness; because everything is better deep fried. Find out how to make it in the recipe below! Set up a breading station with 3 bowls. bowl 1 should contain flour, bowl 2 should contain beaten egg, and bowl 3 should contain the panko. season the flour and bread crumbs with salt+pepper and any additional spices of your preference such as cayenne. You can also add some hot sauce to the egg mixture. Cook 3-4 minutes per side until pink and juicy on the inside. place a slice of cheese on top when its almost done. To assemble the burger, put sauce on the bottom bun and then place lettuce, tomato, and onion on it. 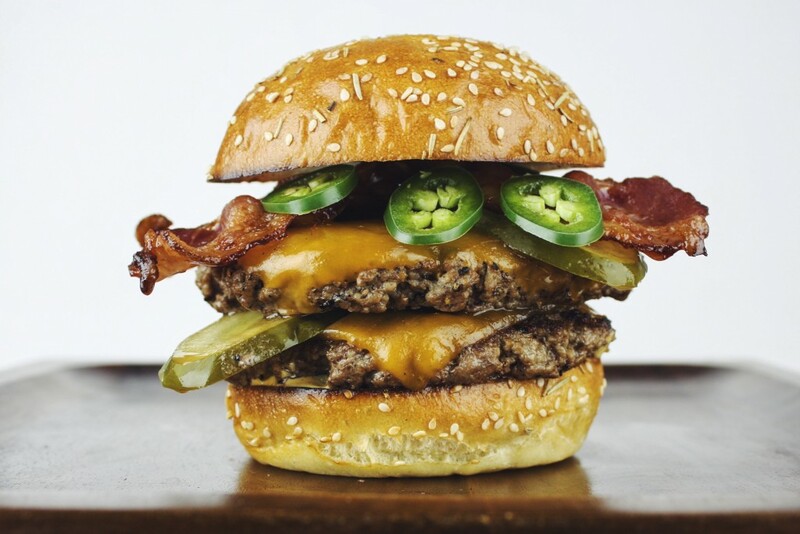 Place the burger ontop of your toppings and top with jalapeños. Take you’re fried mac ‘n cheese and put it on the burger (you can cut them in half to expose the inside or leave them whole). Squish everything down with the top bun and dig in!